I'd be super stoked to get your support in helping bring the system to life. The system is amazing. Especially if you ski. No longer do all your shots have to be looking down your ski pole. You can rotate the GoPro so it sits on any angle between 1º and 360º so you can frame your shot anyway you like. You can change your GoPro from mount to mount in 3 seconds or less so once you've got the ski pole mounted shot you can put your GoPro on your Chesty or helmet with the flick of a lever. 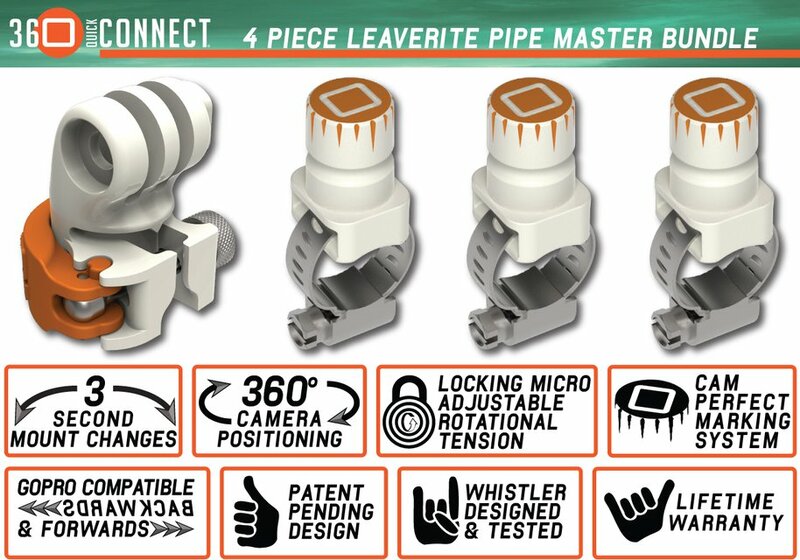 The Leaverite Pipe Master mount shown is so small and durable, you leaverite where you mounted it and forget about it until the next time you need it. TO SUPPORT US ON KICKSTARTER, CLICK HERE. 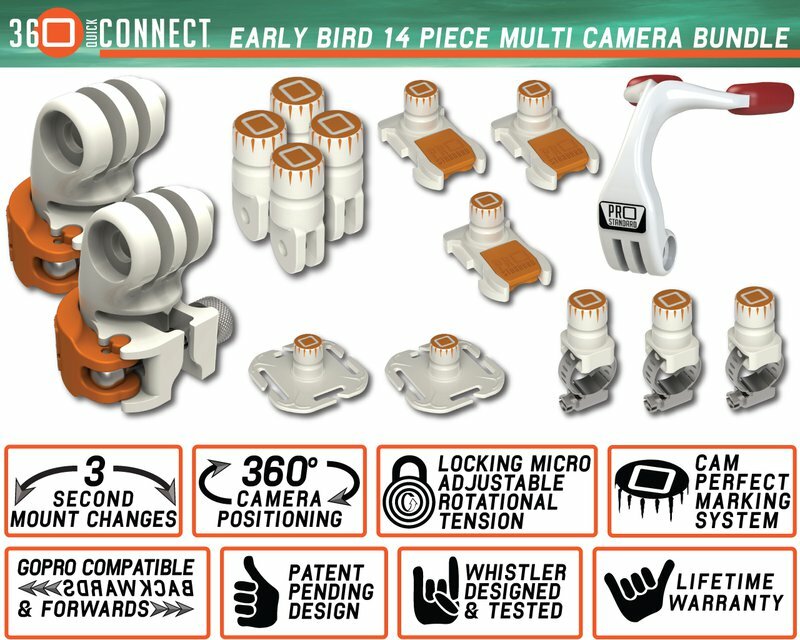 As a Hall of Fame snowboarder, professional photographer, filmmaker, inventor and longtime GoPro evangelist, I’ve distilled my 35 years of near-death experiences and lugging camera equipment around the world into a camera mounting system that will fundamentally change how you shoot with your GoPro. My patent pending design works with every mount and accessory you already own and it will enable you to do things with your GoPro that you never could before. Think of my 360 Quick Connect as the ultimate cheat code for your GoPro. I love my GoPro but I hate the GoPro bolt and how “this is the only angle” GoPro’s Quick Release system is. There seems to be a mount for every sport, product, and situation but no way to change between them quickly and easily -- until now. What's needed is a way to move your GoPro from mount to mount quickly and easily without having to mess with that !$@%# bolt every time or buy into a whole new family of mounts. I wanted to put my GoPro on any angle while it's on any mount AND be able to adjust that angle on the fly, so I could up my “good shot” ratio. My 360 Quick Connect means you can spend more time shooting and less time screwing around with the GoPro bolt to go deeper into your grab-bag of mounts. A better solution shouldn't require tossing out all the perfectly good accessories you already own, so I sat down (for way longer than I thought it would be) and created the patent pending 360 Quick Connect Camera Mounting System. It’s amazing. You can switch mounts in less time than it takes to click the Like Button. 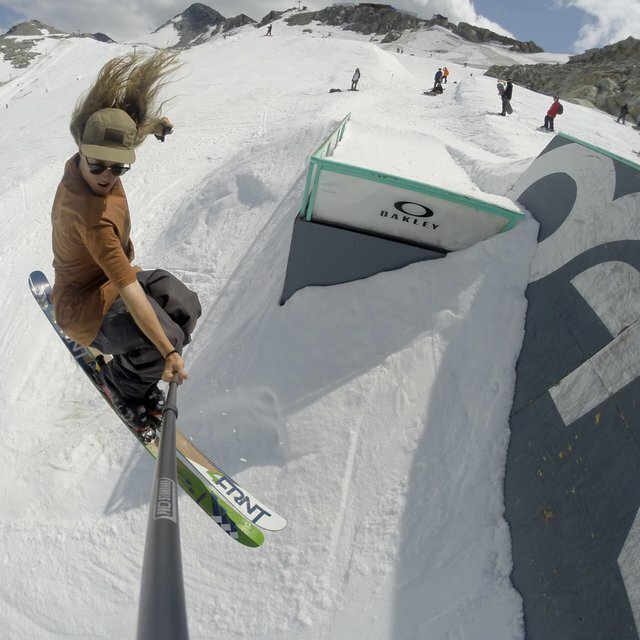 You can put your GoPro on any angle. You never have to mess with the GoPro Bolt after you mount your camera. The pivot and rotational settings lock so you don’t have to reset them when you change accessories. Because it’s so easy and so quick, you can change accessories for just one shot and then switch back to your default setting. 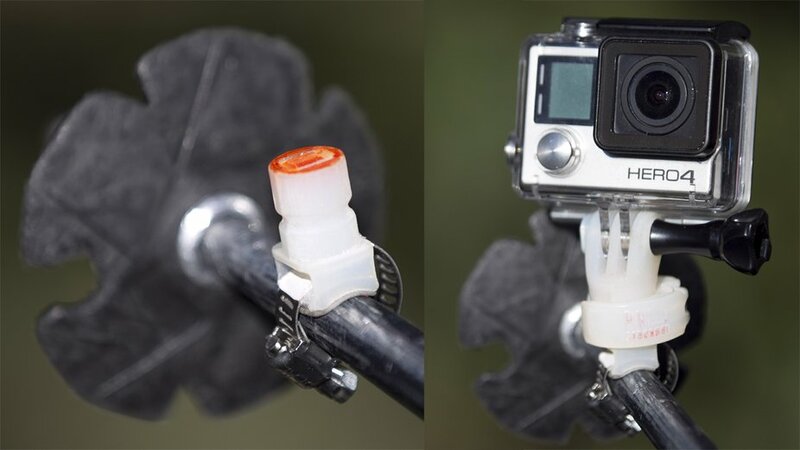 It doesn’t get much simpler: Put a 360 Quick Connect Camera Mount on your GoPro and a 360 Quick Connect cleat or tine connector on each of your GoPro accessories and you're good to go. I wanted to add to the universe of GoPro mounts and accessories in a way that makes you, the GoPro user, fall in love with your camera all over again. This system needs to be out of my head, into your hands and onto your mounts. The factories are lined up and ready to go. What I need to make this happen is your support to build the molds and produce the first run of parts. 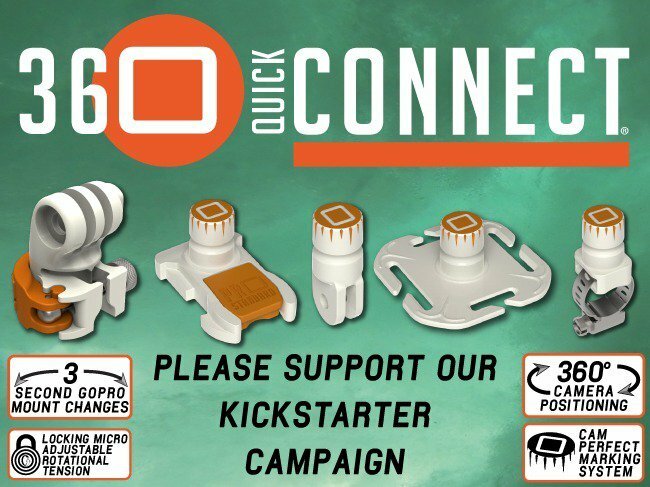 Please support this in any way you can by purchasing 360 Quick Connect for your GoPro and sharing this project with everyone you know. Eliminate having to use the GoPro mounting bolt to change mounts. Enable the user to move their camera from mount to mount with no tools, faster than the speed of human boredom. Be quick and simple to operate with as few parts as possible. Allow the user to rotate their camera to any angle between 1º and 360º. Feature adjustable rotational tension, so users can decide how easily the camera rotates, choosing any tension between freely rotating to locked in position. Enable compositional freedom so you can put you or your subject anywhere in the frame instead of "stuck in the middle". Feature a system of markings to eliminate the guesswork involved in setting up shots. Lock on to the mount so you never lose your camera. Be backwards and forwards compatible with all GoPro and 3rd party mounts and accessories. Be as small and as low profile as possible. The 360 Quick Connect System meets all these design specifications. 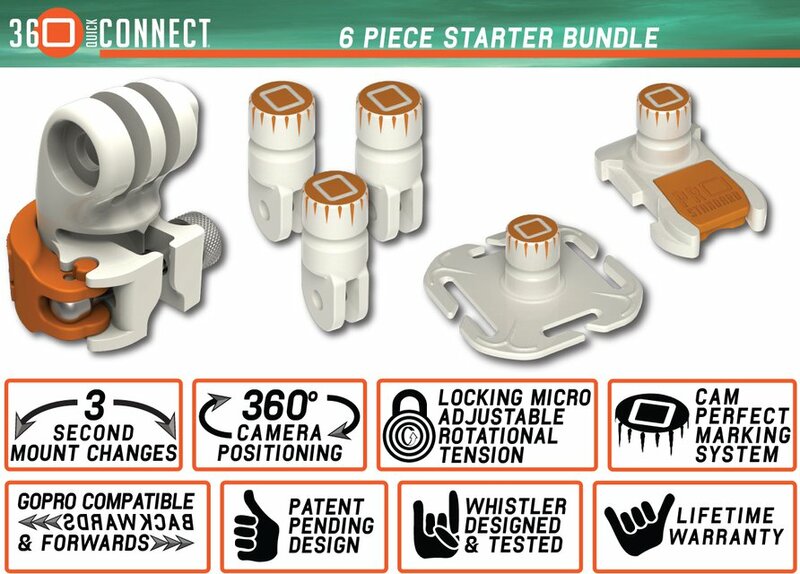 One of the best things about the 360 Quick Connect system is how small the parts get when you have nothing but the mounting stud to place on your gear. Because of that, we call some of our parts "Leaverite" Connectors because once you strap the webbing connector on to the shoulder strap of your pack or the chest of your PFD and mount the Pipe Master onto your ski pole, handlebars or roll bar, you'll want to leave'r right there because they are so small they disappear into your environment until you need them. The design of the stud ensures that no matter what angle you put the mount on, you can get the camera angle you want and you never have to look at your selfie stick in the middle of your shot ever again. With a 360 Quick Connect cleat or tine connected to each of your mounts and accessories, your GoPro is so easy to change from one accessory to another that you’ll happily change accessories for a single shot, without even thinking about it. It's also so easy to tweak the angle your camera is at that it's no effort to nudge the framing to perfection so you or the selfie stick is out of the center of the shot instead of going with "Meh, good enough", framing. Like Eminem said, you only get one shot. I say "Everything only happens once". That one shot might turn out to be the best shot you’ve ever taken. A shot that, with GoPro’s mounting system, you might never have taken because the hassle in changing seemed to outweigh the reward of the shot. It’s so easy to take the less than three seconds to change to another accessory so that you just do it without thinking. There’s no GoPro bolt delay of game penalty, just the reward of a better shot. To get “the better shot," the 360 Quick Connect creates and combines complete compositional and rotational freedom with the ability to change your accessories and adjust your shot with unprecedented speed and accuracy. In short? It gets the stupid pole out of the middle of the shot. Another delay of game penalty with the GoPro bolt is how it has you resetting your pivot angle and tension every time you change mounts. 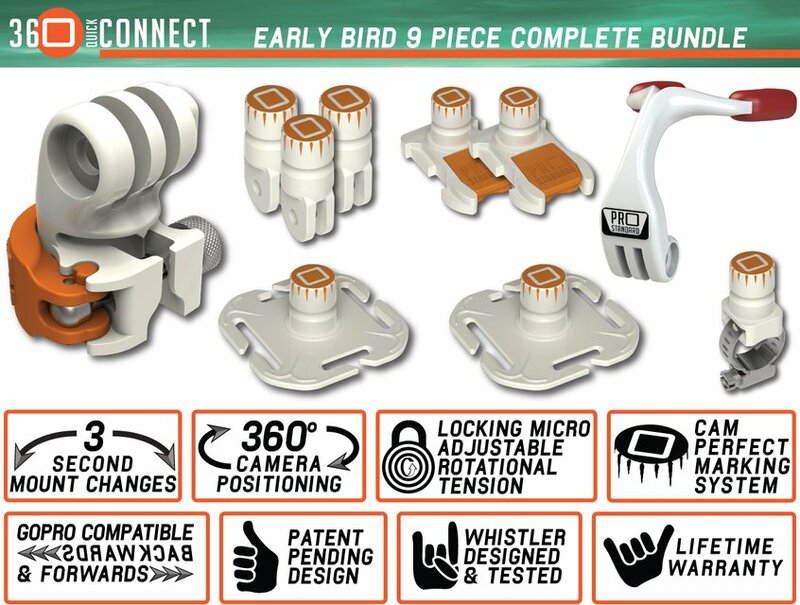 With the 360 Quick Connect System, your pivot angle, pivot tension AND rotational tension settings don’t change when swapping the camera mount between accessories. Once the rotational tension dial is set it won’t change when you open and close the lever. Not having to use the GoPro bolt allows the pivot angle and tension to stay the same as well. Using Cam Perfect Markings, you can position your GoPro precisely and recreate previous shots. Use the numbers and lines to memorize great angles to reuse instead of guessing “Yeah, I think it was lined up like that last time...” or wasting time and battery life opening the GoPro app. 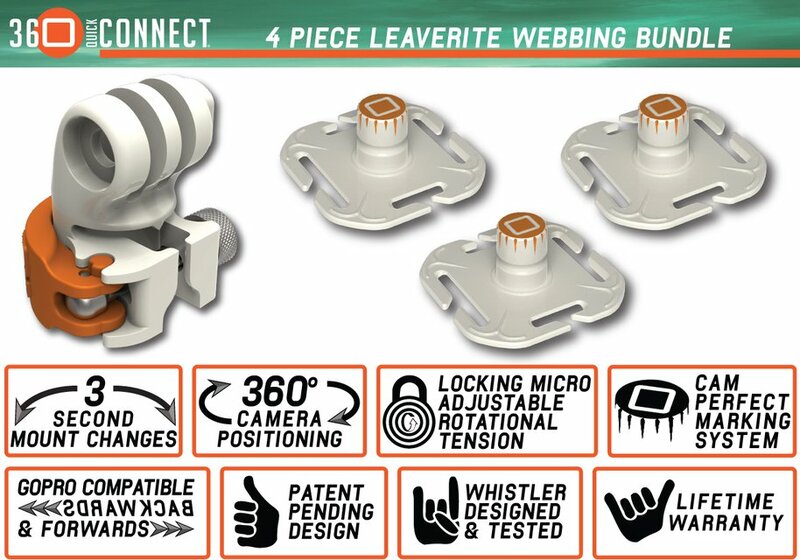 On 360 Quick Connect parts, the Cam Perfect Markings aren't just on the tines, the markings are built into the mounting stud and the center tine of the camera mount, so you can position the pivot and rotational angles of your GoPro perfectly. My first product "The Grill Mount" had the Cam Perfect Markings on the tines. 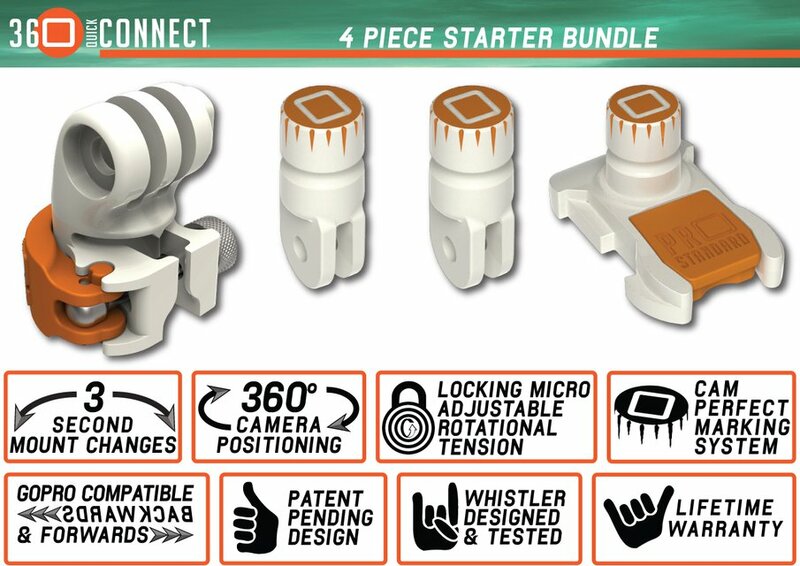 With 360 Quick Connect, the Cam Perfect markings are in two places. On the tines and now on the mounting stud with the Registration Pointer on the camera mount. I premiered the Cam Perfect Marking System on my first product, the multi functional Grill Mount. The Grill Mount is a heat-moldable, custom fit mouth mount that also works as a tripod, handgrip, hook, wall mount and clamp mount. It can be held between your fingers or with just one finger. It can clamp over your whole hand so you don't even really hold it. Hook it over your pocket or put it in your pocket. It's small and contoured to avoid snags. When you hold it with your mouth, the GoPro is positioned close to the pivot point of your head and neck resulting in footage that looks like it was filmed with a spendy 3-axis gimbal. The heat moldable pads wrap around your teeth like a mouth guard, which reduces the risk of concussions, increases your balance and strength all while getting better footage. Not bad for $29.95... or included for FREE if you choose the right reward package.